Research from Amnesty International has identified China as the country with the most welcoming attitude to refugees. The country scored higher than the 26 other nations surveyed in terms of positive attitudes held by members of the public towards refugees fleeing war or persecution. The research looked at a number of attitudes including whether refugees should be given asylum, whether national governments were doing enough and how much help people would consider giving refugees themselves. 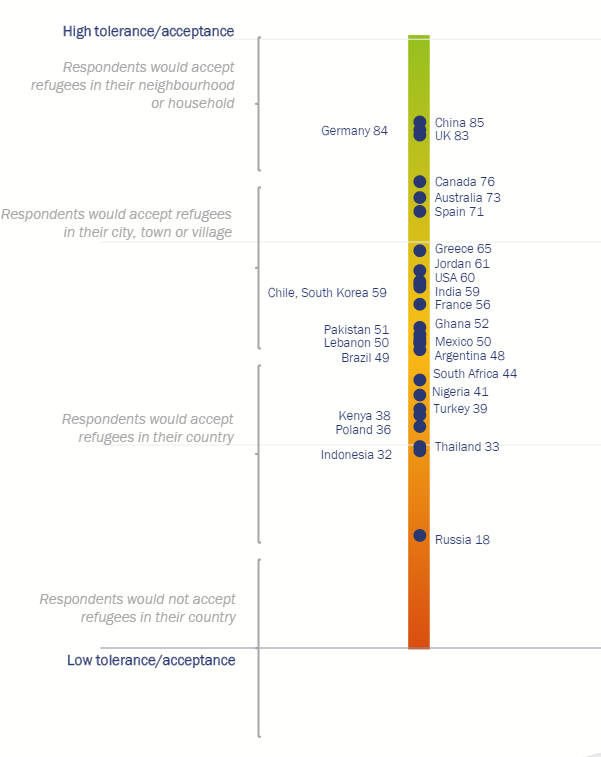 The Refugees Welcome Index ranks countries on a scale of 0 to 100, where 0 represents all respondents saying they would refuse refugees entry to their country and 100 represents all respondents saying they would accept refugees into their neighbourhood or home. Germany and the UK follow closely behind China with positive attitude scores in the 80s. The United States scores 60% while France scores 56%. Russia is at the bottom of the list of countries surveyed with only 18% of respondents saying they would welcome refugees in their neighbourhood or home. Should governments be doing more? Globally, two out of three respondents agreed that their national government should do more to help refugees fleeing war or persecution. Again, agreement is highest in China at 86% followed by Nigeria (85%) and Jordan (84%). Agreement is particularly low in Thailand and Russia, at under 30%. In Turkey, India, Thailand and Russia, majorities think that their national government should not do more to help refugees fleeing war or persecution. Who is most likely to think refugees need more help? The report found that support for increased government action increased by 5% among those with a higher level of education. Support was also 6% higher amongst those with higher income levels. Finally, those living in cities were 10% more likely to agree with the need for increased government action to help refugees. Have you read? More people are internally displaced than ever before, and these are the countries worst affected Europe’s refugee crisis: what you need to know Which country has hosted the most refugees?